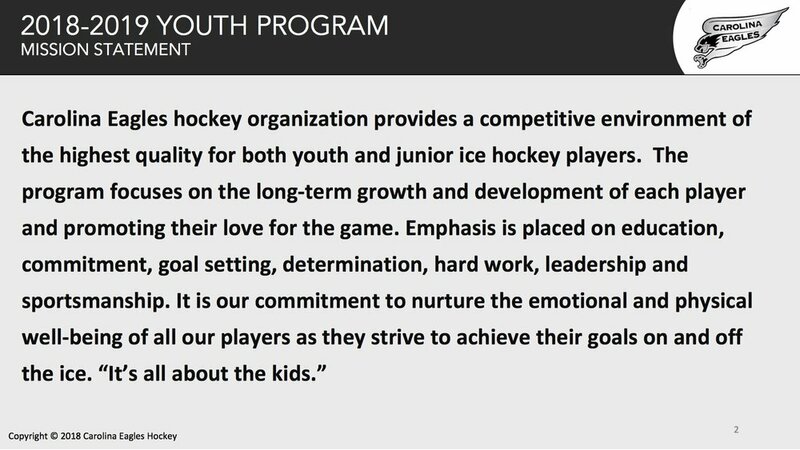 The Carolina Eagles 2018-2019 youth program has been announced. You can find all of the slides for the presentation here. Here is the Lady Eagle 2018-2019 program. If you have any questions please contact us via email or phone (919-397-4804). Registration for tryouts is open now. It is all about your player. If we do not think our program is the right fit we will send you to one that is. We want your player to have the best season each year for their needs not a programs. 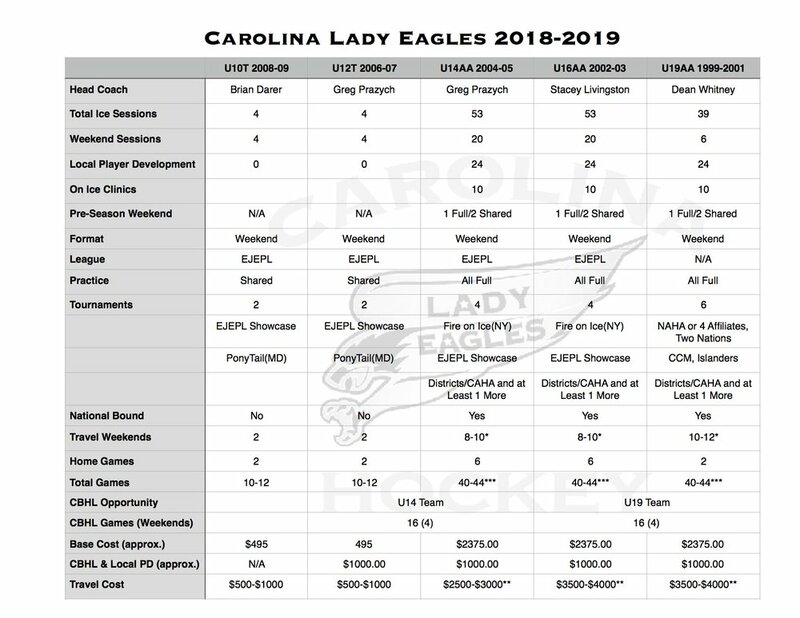 The Carolina Lady Eagles take part in all of the unique program enhancers provided by the youth program including our own development series, goalie clinics and our U10-U16 teams will be in the exclusive EJEPL league this season. 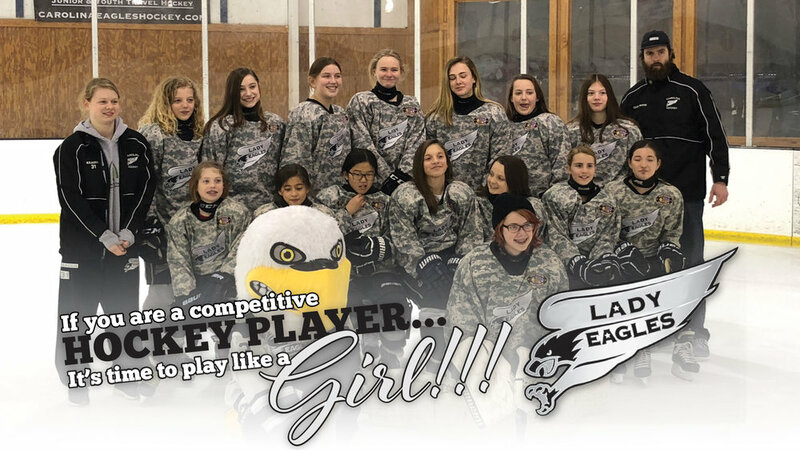 We added a U12 tournament team this year that got together for three weeks, going 2-1-2 during that period of time only loosing to the NOVA U12AA team at Ponytail. They also participated in the #GlobalGirlsGame beating RYHA U12 Ladies 2-1 in their first game as a team. Here are some highlights. Our U10T and U12T teams will continue to provide awareness and support for the Special Operations Warrior Foundation that provides educational scholorships to the children of fallen special operations soldiers. Here are the coaches for the 2018-2019 season. We also match every coed female hockey player with an older full time player to mentor them during their season. Here is a great video of one event. We play in leagues and strongly feel it is important to have something to play for. We are the only girls teams in our market that are in a league and have been since we were Lightning many years ago. We have helped create a new EJEPL southern girls division which is exclusive to the Eagles and Rush in the Carolinas. Here are the teams we will be putting on the ice for the 2018-2019 season. U10 and U12 will follow our player development model of playing coed until U14, while our U14, U16 and U19 teams will be full time Eagles teams. Our teams have many regional players on them. If you are a regional player we discount the cost so you can get weekly player development in your area. We are working with rinks in Atlanta, Hampton, Wilmington, Charlotte and Greensboro to help provide all girls player development regardless of what logo you wear. Financial aid is available so please ask. Here is a list of schools that have contact our players this year. Every graduating player has the option to play college hockey next year. We have the most fun tryouts of anyone in the area .... so are you Ready to signup?..... Click here to register now. Becoming a Lady Eagle is the best gift to give your mom on Mothers Day! !